Chiltern cupboard knob in pewter effect finish. Available in a 32mm diameter knob, 35mm projection or a 38mm diameter knob, 36mm projection. 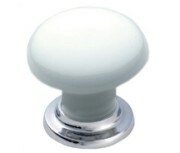 White porcelain cupboard knob available on a 28mm diameter polished chrome rose, 35mm knob diameter, 35mm projection. Solid brass ringed cupboard knob. 24mm diameter, 24mm back rose, 26mm projection. 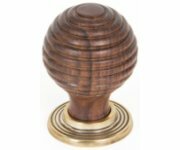 Rosewood beehive cupboard knobs, available in 35mm or 38mm diameter knob size, on antique brass or polished nickel back rose. 35mm Knob on 32mm back rose, 50mm projection. 38mm Knob on 37mm back rose, 55mm projection. 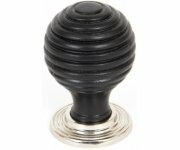 Ebony beehive cupboard knobs, available in 35mm or 38mm diameter knob size, on antique brass or polished nickel back rose. Rustic style hand forged beeswax beaten cupboard knob, available in 22mm diameter knob - 21mm projection, 30mm diameter knob - 25mm projection, 40mm diameter knob - 34mm projection. Dimpled effect square cupboard knob in pewter effect finish. 32mm x 32mm square knob, 25mm projection. Hammered effect cabinet knobs in a pewter finish for a traditional country kitchen look. 32mm x 32mm square, 23mm projection. Cletic pattern cupboard knob. Size 30mm diameter. Available in Aged Antique Brass & Pewter. 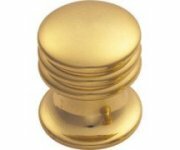 Polished brass Georgian cabinet knob. Available in 25mm, 32mm, 38mm, 42mm & 50mm sizes. Copper one piece Victorian cupboard knobs. Available in 25mm, 32mm, 38mm, 42mm & 50mm diameter sizes. Available in Polished Copper & Satin Copper.